Hilarious photo! :) I'm having a fun-filled day of drinking, awkwardly hugging old classmates and trying to stay away from creepy dudes at my hometown's parade and bar crawl. Cheers! Haha STOP IT. This picture is totally epic. I like you even more now (if that was possible). Have fun! I am so excited for the weekend and I hope you have a great one. hehe! I went out for St. Pats last night to beat today's crowds :) Now nursing a headache :P Hope you have a fabulous day out and Happy St. Patrick's Day! I managed to avoid a headache somehow, successful St. Patrick's Day! I surprisingly didn't run into anyone from back in the day this weekend, which I think is how I prefer it. 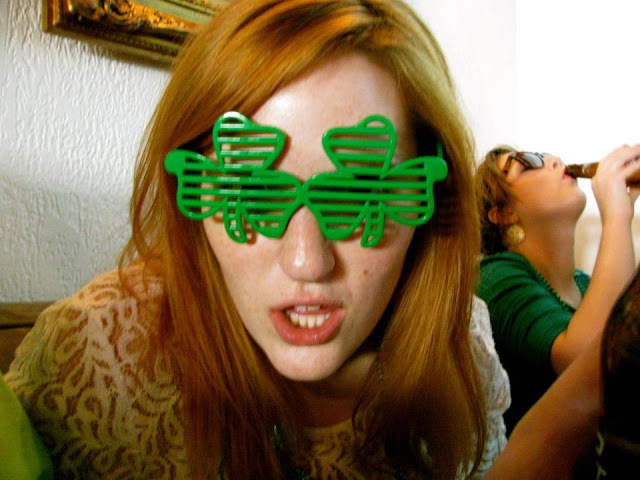 A St. Pat's barcrawl sounds super fun! That photo is amazing...hope you had a fabulous St. Patty's Day!